The hottest topic since iPhone 6S release must be the A9 Chipset. The first time, Apple gave its chipset to two different suppliers – Samsung and TSMC respectively. But because of different process conditions, the temperature and battery life of iPhone 6S SoC perform with difference finally. Though official of Apple has explained that the gap is only about 2%-3% which even can be ignored, many tests from folk still showed the iPhone 6S A9 Chipset from TSMC by 16nm FinFET process is better. No matter the battery life or the temperature are battery than Samsung A9. So that many iPhone 6S users showed that they can’t accept the device with Samsung A9 and asked for replacement until got the one with TSMC A9. But is that real true or accurate even after Tomshardware test? We have to say the tests depending on only software and the tests from users are a little non-authoritative and non-overall. So now, Tomshardware website steps in the problem and completes a detailed test. They take iPhone 6S Plus as example and compares their performance, temperature and battery life. Let’s check the results. After running several performance tests, we can find iPhone 6S Samsung A9 and TSMC A9 vary with in 1%. So we can affirm that they are same here. For many users, the biggest dispute between two versions iPhone 6S A9 Chipset is the battery life. It’s really an important reason for people to choose cellphone. And several tests from folk all proved that TSMC 16nm A9 could save more than the other. But is it reliable? TH said “no”! All of the test results from Tomshardware are opposite. 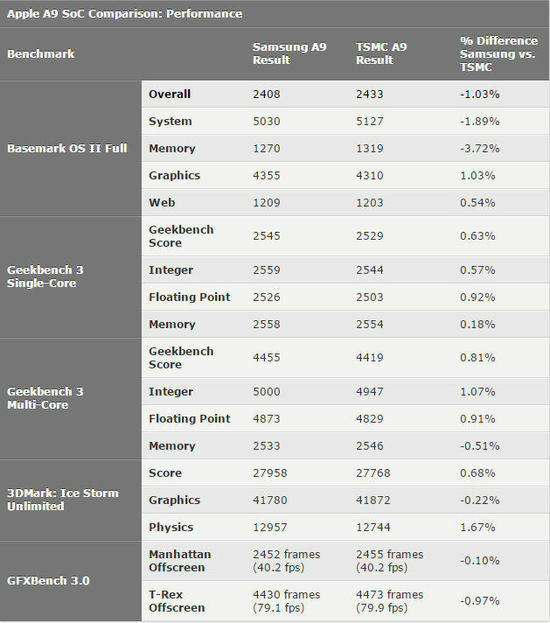 On Basemark OSⅡ, the battery score of Samsung 14nm A9 is higher than TSMC obviously with 8.13% score. As for the battery lifetime, Samsung version A9 is 167 minutes while TSMC version is 151 minutes, Samsung A9 is batter as 10.76% difference. On GFXBench test, the difference between their battery performances is only 0.32% and battery lifetime is only 5 minutes. iPhone 6S Plus with Samsung A9’s back skin temperature is 118°F while the one with TSMC is 120°F. Samsung A9 version is lower. After all, the iPhone 6S A9 Chipsets will be a little different even from only one supplier. So no matter the Samsung A9 or the TSMC A9, they all can work well in your iPhone 6S. And it’s your own decision the next. What's more, if you need any iPhone 6S repair later, please pay attention to witrigs and my blog.